Known for their explosive stage presence and dedication to giving a great energetic show to their fans, This ECMA winning band has performed live on many national television programs such as "The Mike Bullard Show", "ECMA Awards" "Much Music" & "Music Plus". 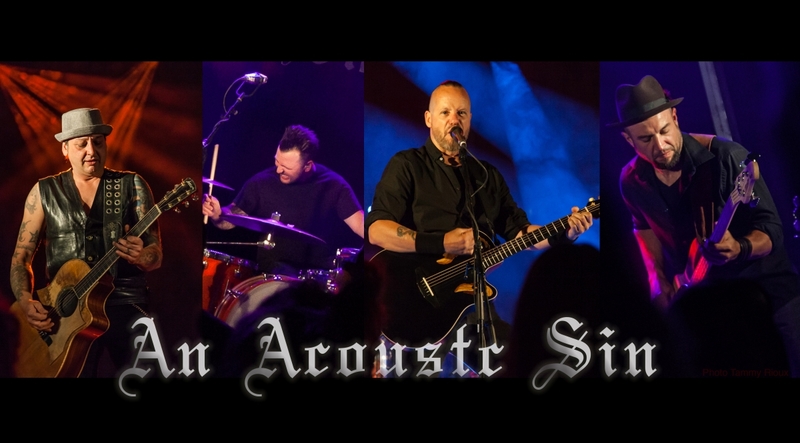 Since 1996 An Acoustic Sin has shared the stage with big acts such as CCR, April wine, The Tea Party, Kim Stockwood, Natalie McMasters, Lenny Gallant, Alana Miles and the Hit-Men All Stars which included: Curly Smith (Boston), Gary Moon (Night Ranger), Kevin Chalfant (Journey), Billy Burnette (Fleetwood Mac), Todd Rogers (Ted Nugent) & Carlo Volhl (Lita Ford) and they also played live on the same set as Paul Stanley of KISS on the "Mike Bullard Show" in Toronto. Canadian Recording Artist "An Acoustic Sin" will simply amaze you. Once you have seen them live you will never forget the name. They are a storm to be reckoned with the energy of a nuclear bomb! In fact... They are the bomb. And all will be swept away in its wake.